In this workflow, we see how the digital thread can be extended from the authority, native CAD design data (PTC Creo, in this case) all the way through internal and supply chain quality, and then back to design. Data harvested through this digital process is organized and traceable to the master model. This is how Model Based Enterprise is done. 2D to 3D Synchronization — automatically transfer 2D drawing annotations to the 3D model in PTC Creo Parametric. Export QIF MBD — Export the model and PMI to the QIF MBD standard file format. STEP AP242, another common MBD standard data format, is supported too. Model Validation — Comparative model validation with CompareVidia. 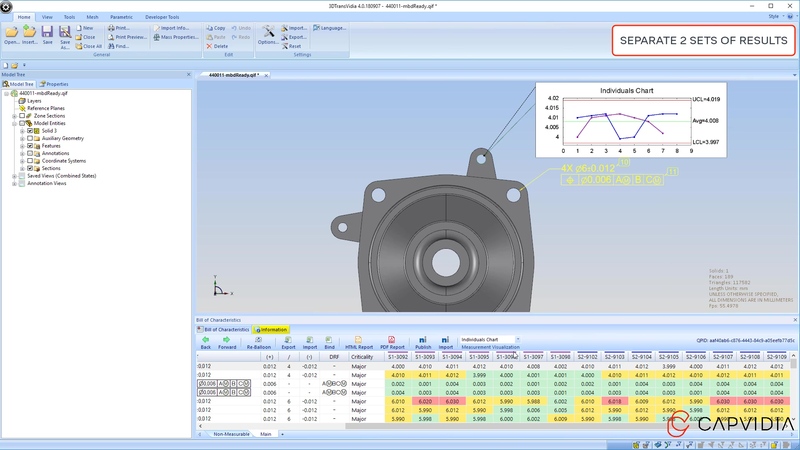 Compare 2 CAD models to detect any differences in terms of geometry, PMI, and other metadata. MBD Ready Check — PMI quality checking and healing. Makes sure that your PMI is semantic and machine-readable. Publish Inspection Reports and Documents — Extract the Bill of Characteristics from your MBD model automatically, and publish to common FAIR formats like Excel and cloud-based platforms like Net-Inspect. Harvest Measurements — Import measurement data back to the model. Data can be imported from a wide variety of sources, and visualized on the 3D model.